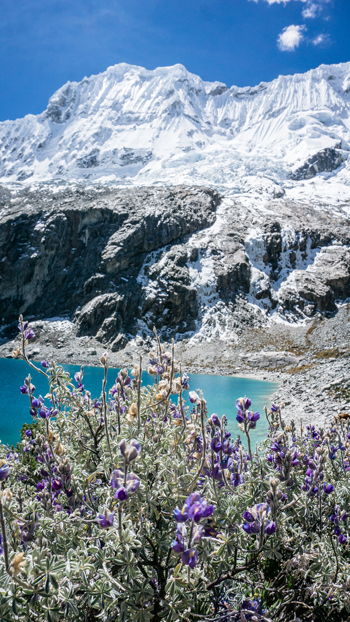 Laguna 69 or Lake 69 is a popular day hike in the Cordillera Blanca, where everyone is talking about when in Huaraz. So we needed to check it out too as part of our acclimatisation program before hitting our 9-day Huayhuash Circuito independently. 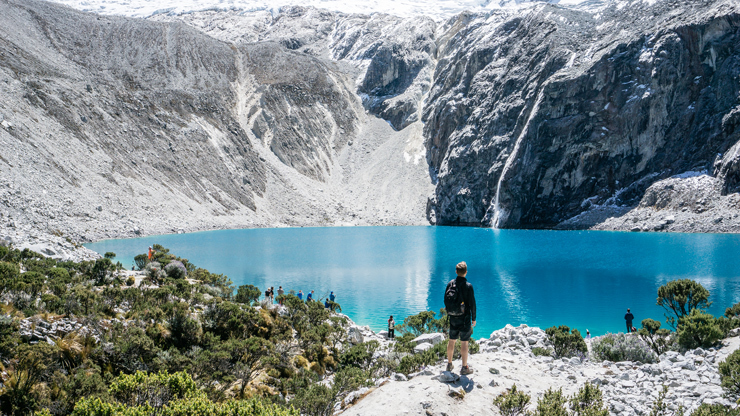 Laguna 69 is a magnificent turquoise lake, surrounded by majestic snow covered peaks. 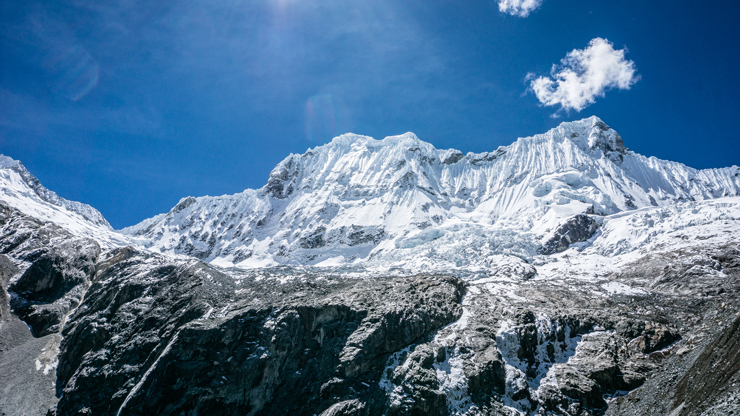 Yes, Huascarán, the Peru’s highest mountain (6,768 m / 22,205 ft) is also present! From the trailhead in Cebollapampa, the trail takes a comfortable flat start. You’ll immediately enjoy stunning mountain sceneries, while the trail gradually increases in steepness. An unexpected scenic lake is waiting for a first photoshoot. The last stretch is tough and will certainly force you to slow down and take some time to catch breath. 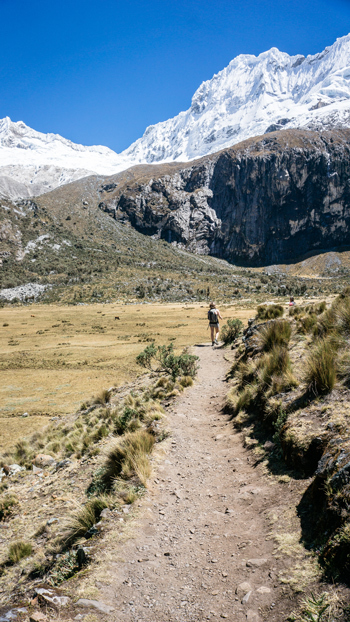 Don’t go too fast and don’t forget to drink a lot of water to avoid altitude sickness. Suddenly, a bright turquoise spot peeks between the rocks and spreads as you continue. The power of its presence literally pulls you towards the magical laguna until it reveals its entire beauty. For a moment, you’re frozen by admiration. It’s a grateful feeling to be standing at the shore of a scenic bright glacier lake encircled by a 360° close-up panorama of imposing mountains peaks. No, unfortunately, Laguna 69 isn’t the spot to escape the crowds. Yet it is a wonderful place and big enough to enjoy this unique scenery in peace. Besides, it’s probably not a bad idea to be accompanied by other hikers during your first hike at high altitude. Count on 2.5 hours to hike up to the lake and 1.5 hours to descent back to the trailhead. Now we’re ready for the next step: hiking to the more remote Laguna Churup! Don’t forget to bring your lunch, water, and sunscreen. As you’ll be in the mountains, also take a sweater and raincoat with you. 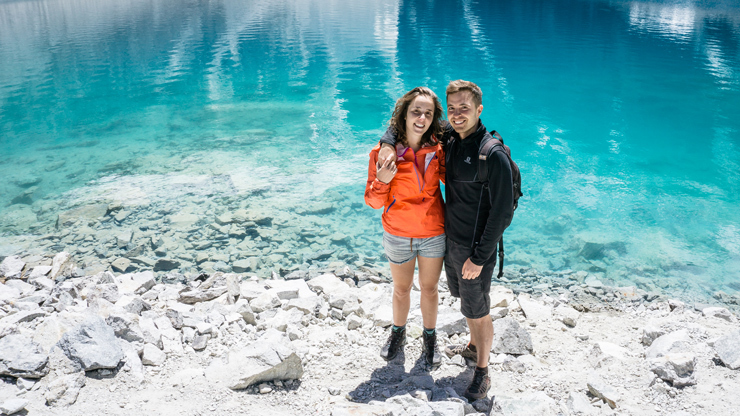 While hiking, it can be hot, but once arrived at the lake, an extra layer will be welcome! Be sure to bring some pills against the headaches too, as you may not yet be acclimatized at this time. 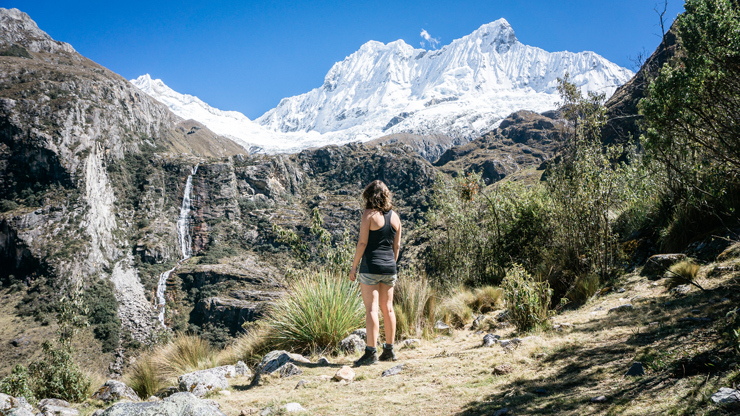 It was our second day around Huaraz and our first hike. We didn’t suffered from any altitude sickness on our way up to the lake. However, headache started as soon we started descending. I guess, that’s part of the acclimatisation process! 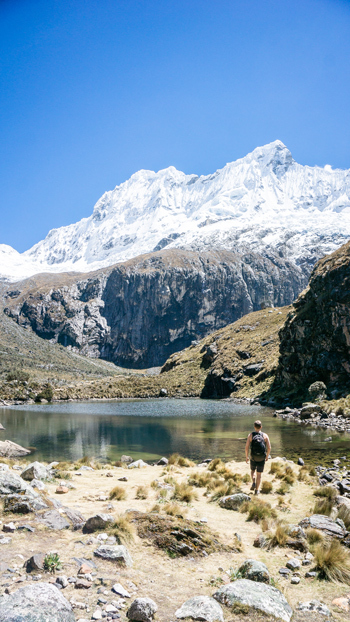 Huaraz is the base for many hiking adventures in the Peruvian Andes, both day hikes, such as this one, and multiday trekkings, such as the Santa Cruz trek or the Huayhuash Circuito. There are several bus services from Lima to Huaraz, of which Cruz del Sur seems to have the best value for money. You can trust them and we never experienced a better bus service anywhere in the world. Two other reliable bus companies are Oltursa and Movil Tours. As the trip will take about 8 hours, taking a night bus can save you your precious day time. The almost 180° reclining seats will assure your as-perfect-as-possible-in-a-bus sleep. Tip: book your Cruz Del Sur ticket directly through their website. Be sure you use the Spanish website version as prices can be a lot cheaper. Google translate will help you translating! 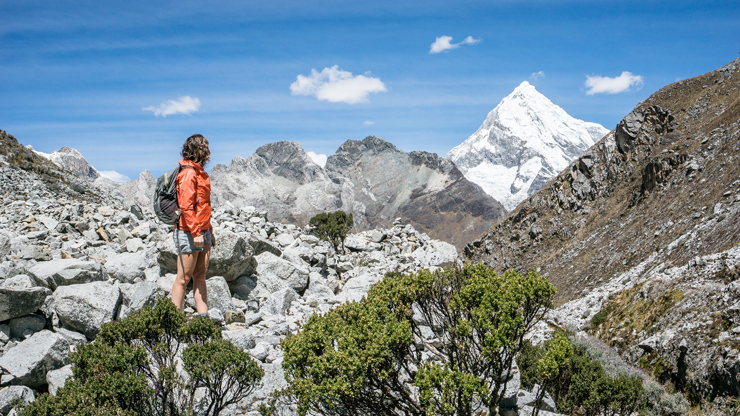 The cheapest and fastest way to get to Laguna 69 is to book a tour at a tour office or hostel in Huaraz. This is still perfectly possible the day before. We paid 35 soles per person. 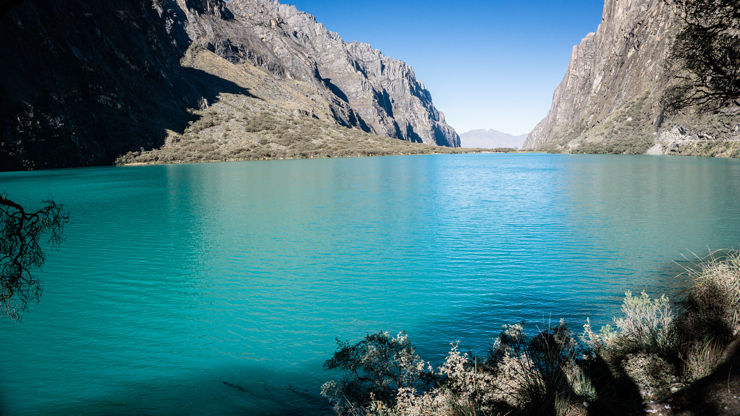 Laguna 69 is located in the Huascarán National Park, so an additional entrance fee of 10 soles is required. The bus, which you will share with ca. 20 people, will pick you up at your hostel around 5 am. It’s a 3 to 4 hour drive from Huaraz to the trailhead. 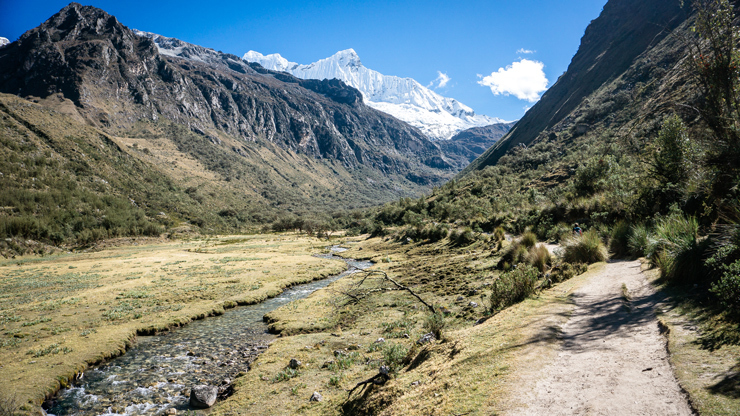 On the way, you’ll take a break for breakfast, before entering the Llanganuco Valley. 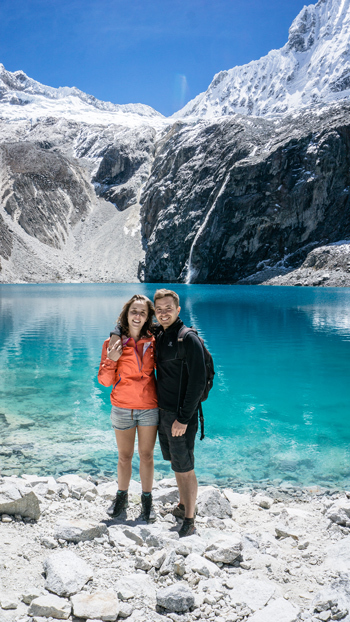 Just before arriving the trailhead, you also make a stop at Laguna Llanganuco, a large turquoise coloured lake surrounded by towering mountains, just to take some photos. Fortunately, once you arrive at the trailhead, you’re free to hike at your own pace. You just need to be back at the arranged time, probably around 3 pm. So basically, you just pay for transportation, which is fine. However, there is guide who stays behind the last hikers, in cause you need one.